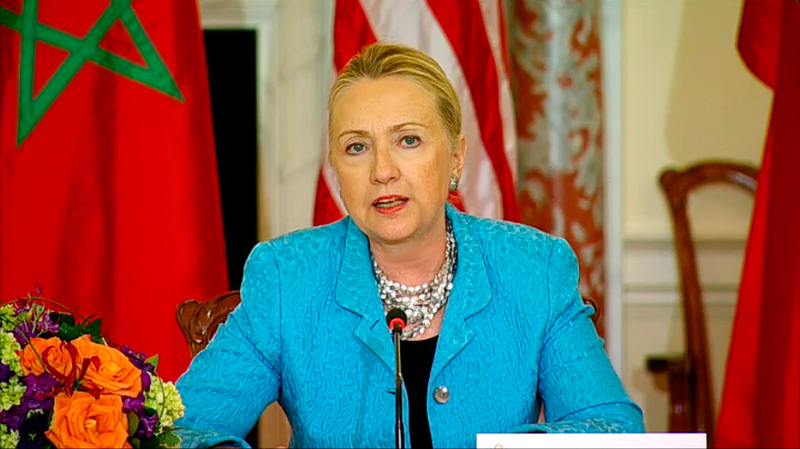 MACP, US State Department (Washington, DC, September 13, 2012) — This morning, during the launch of the Morocco-US Strategic Dialogue at the US State Department, Secretary of State Hillary Rodham Clinton praised Morocco as a “leader and a model” in a region where the US needs a strong, reliable, and influential ally. The Morocco-US Strategic Dialogue, one of less than two dozen such agreements in existence, and the only one in North Africa is the result of more than a decade of focused, comprehensive leadership and cooperation by King Mohammed VI with three US Administrations to strengthen Morocco-US relations and implement the two countries’ shared vision for the Middle East and North Africa. Addressing the recent tragic attacks in Libya, Sec. Clinton said that she appreciated “the condolences that your government [Morocco] expressed to our Embassy in Rabat. And even though that tragedy happened far away in Benghazi, we found a reminder of those deep bonds that connect Morocco to the United States.” Secretary Clinton noted that Ambassador Chris Stevens, who was killed during the attacks, “fell in love with the region” after serving as a Peace Corps volunteer in Morocco. Morocco and the US have both condemned the attack on the US Consulate in Benghazi as appalling and unjustifiable, calling for tolerance and dialogue to counter those who seek to spread hatred. Last year, Secretary of State Hillary Clinton signaled the creation of the Strategic Dialogue, recognition of more than a decade of peaceful reforms and stability under the leadership of King Mohammed VI. With today’s signing by the two countries, the Strategic Dialogue, which will not be affected by changes in administration, leadership or personnel, officially begins and builds on bilateral advances already achieved, including the Morocco-US Free Trade Agreement, the Millennium Challenge Compact, and Morocco’s designation as a major non-NATO ally.